Sometimes, on some walks, you’re glad to be getting near the end. Sure signs of this include constant thoughts of showers, soft beds, fresh food and clean clothes. And of just not walking for a good long while. Our final day on the Abel Tasman Coast Track isn’t one of those days. The weather is fine, we are feeling fit, and the walking is interesting. 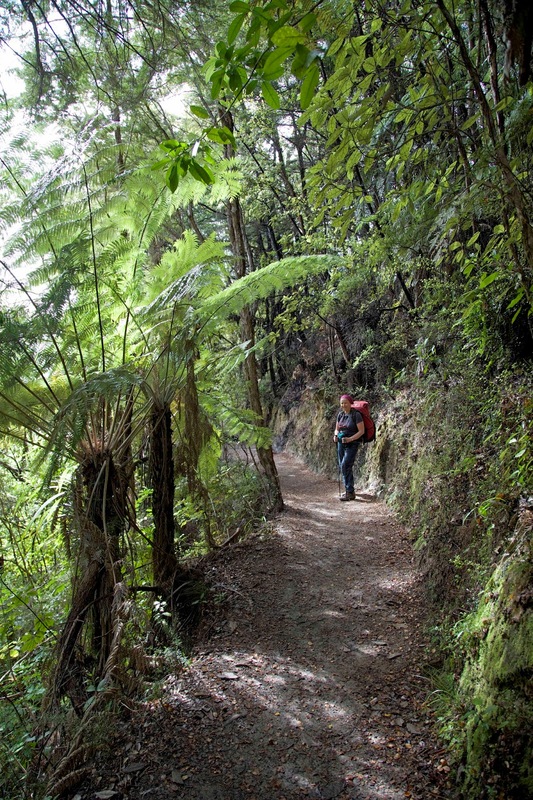 We have the bonus of a walking companion in young New Zealander Brad. He is sociable, as Kiwis invariably seem to be. Is it the result of living in an isolated place at the end of the earth? If so it works well for Tasmanians too. We find plenty to chat about as we meander above the nearby coast. We’ve now drawn level with Adele Island, which we’d paused alongside on our first day’s water taxi ride. 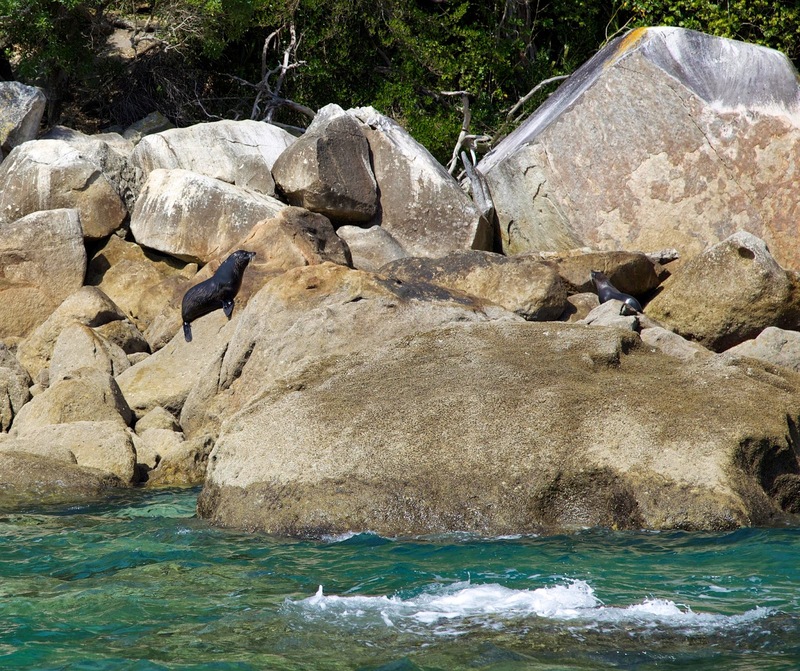 That day we’d seen sea birds galore, and were also thrilled to see New Zealand fur seals on the shore. The island is a focus of environmental restoration, with the biggest job being to bring back the dawn chorus. 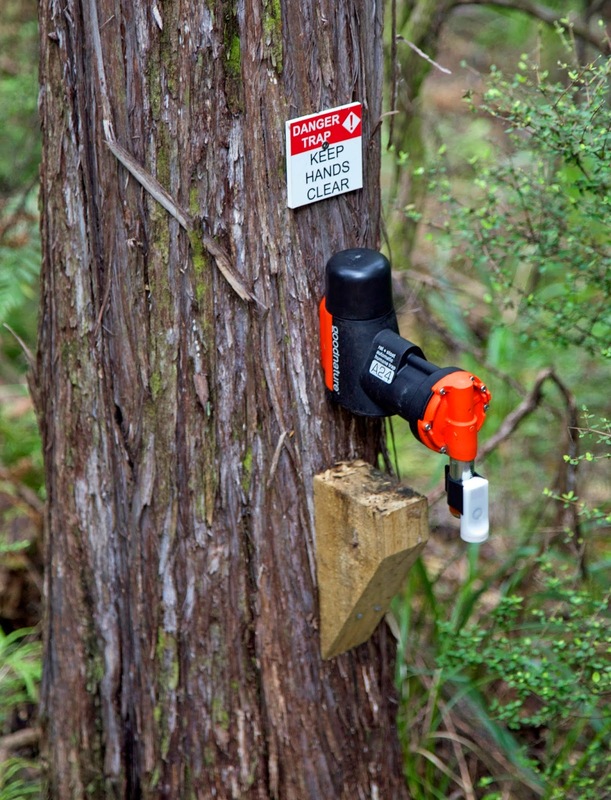 The Abel Tasman Birdsong Trust, Project Janszoon, DoC and various private donors have combined to trap and poison introduced predators such as rats, possums and stoats. 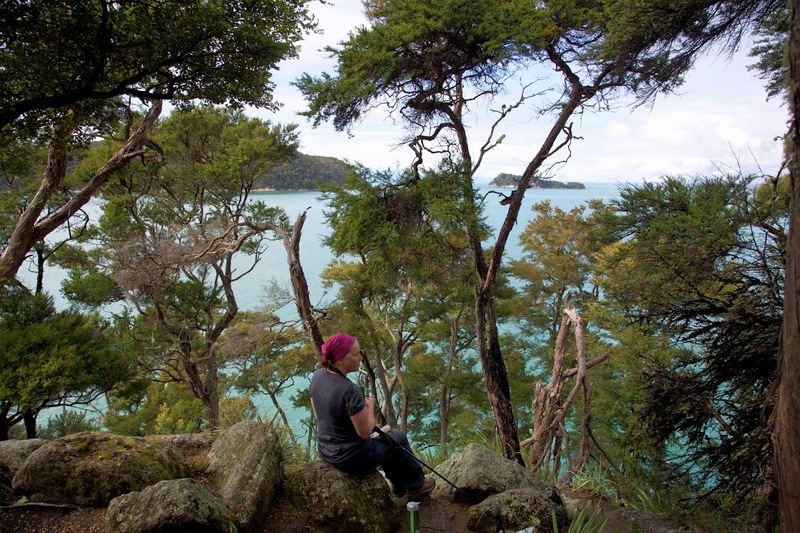 Adele Island has been a pilot for a larger project which has seen 70% of the Abel Tasman National Park covered by the trapping program. We come across one of the newer humane traps. The traps are powered by compressed C02 gas. The possum version is activated when a possum bites on a lure. The rat/stoat version requires the animal to move aside a leaf to investigate a lure. Either way the animal activates a steel piston, powered by C02 gas, which strikes the skull of the inquisitive animal and kills it instantly. Once the animal has been struck, it drops to the ground, leaving the trap set for the next pest. Even though this method of pest eradication is much less labour-intensive than the older tunnel traps, there is still a huge commitment required to simply keep pest numbers down. Complete control is but a dream, and the the incredibly beautiful dawn chorus of native birds like tui, tieke, korimako, kakariki and kaka, is heard in relatively few localities. English botanist Joseph Banks, while in this region aboard Captain James Cook’s Endeavour in 1770, wrote this about the local birds. Even Cook, not one to wax lyrical, was moved to describe the korimako (bellbird) as sounding ‘like small bells exquisitely tuned’. 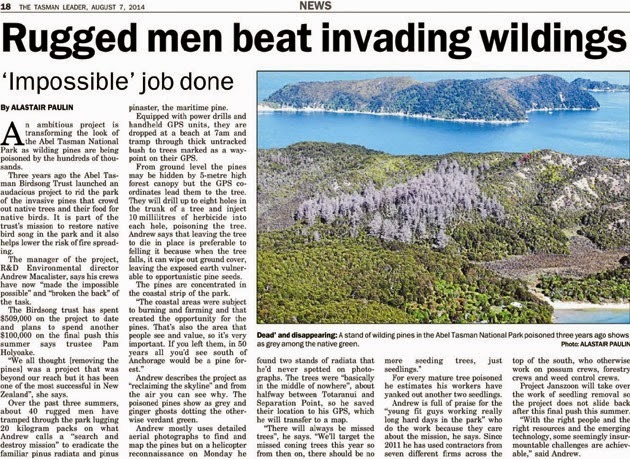 As if predatory mammals were not enough of a threat to New Zealand’s native species, pest plants have a significant impact here too. As we walk towards our finishing point, we see signs of wilding pine infestations. 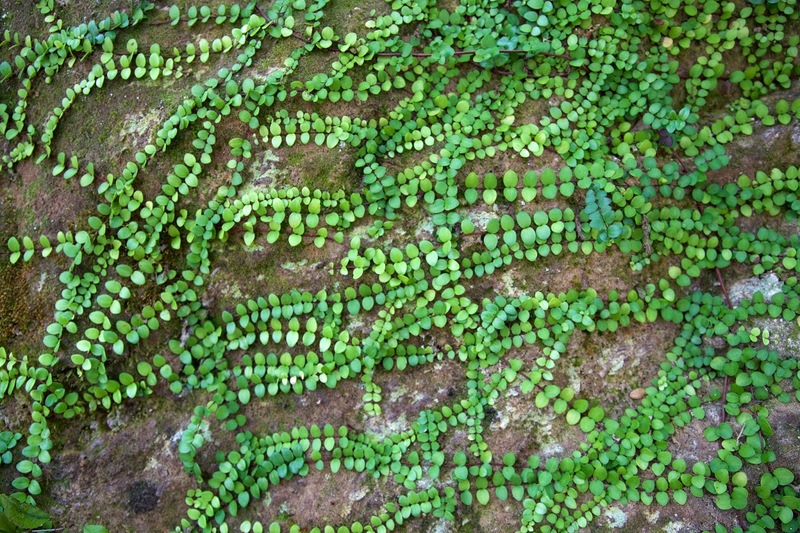 These are any of ten different introduced conifers that have gone wild in New Zealand. A significant effort in this park has seen many of the infestations poisoned. For the moment they are evidenced by ugly brown stands of dead trees on the steep green forested slopes of the hinterland. In the longer term the dead pines will be – and already are being – replaced by native bush, much to the advantage of the bird species. By late lunchtime we have reeled in the small settlement of Marahau. We cross the final few bridges across the tidal flats, and walk into the café that marks the start/end of the track. There Brad joins us for a celebratory hot lunch and cool drink. We raise a glass to a great walk on this Great Walk. Abel Tasman Coast Track 2: Weatherproofed?